Buying or selling a business can involve complex legal processes and documentation. What may seem like a simple transaction, can become problematic very quickly if the parties involved do not understand the process. One of the key issues to consider before a business sale is whether the assets of the business, or all the shares in the company that owns the assets, will be sold. These two methods may have significant implications for both the vendor and the purchaser and should be considered by both parties when structuring the transaction. In determining which structure is more appropriate, consideration should be given to the legal, commercial and tax implications, as these consequences and risk exposures can differ significantly. Under an asset sale, the purchaser acquires some or all of the assets owned by the vendor that are used in its business and the vendor retains the ownership of the corporate entity. contracts may require the consent of the counterparty before a transfer can occur. If it is anticipated that the consent to transfer may be difficult to obtain, this may be a factor going towards doing a share sale. If the purchaser wishes to take on the employees, the relevant employees’ employment with the vendor will need to be terminated and those employees would need to accept new employment with the purchaser. A purchaser is likely to prefer an asset sale because the purchaser can ‘cherry pick’ which assets to acquire. Another reason the purchaser may prefer an asset sale is because the company’s liabilities and encumbrances are not automatically transferred to the purchaser unless the parties agree otherwise (as is the case with a sale of shares). Further, the price paid for the CGT assets is reflected in the purchaser’s cost base for these assets which could reduce capital gains tax that might arise on a future disposal of those assets. Under a share sale, the purchaser acquires all the shares in the company that owns the assets and runs the business. By acquiring shares, the purchaser indirectly obtains ownership of all assets and assumes all liabilities of the company. The parties will need to ascertain all the shareholders of the company and the number and type of shares comprising all the issued capital. Additionally, the parties will need to identify and comply with any restrictions on transfers, including any pre-emptive rights provisions in the company’s constitution or shareholders’ agreement. third party may have the ability to terminate. The purchaser should cause, and ensure that the sale agreement requires, the vendor to obtain such consent prior to completion. Similarly, all employees remain with the company under their employment agreements, subject to any change of control provisions under which consent from the relevant employee may be required. As the purchaser indirectly assumes all of the liabilities and encumbrances of the company (whether recorded or unrecorded and whether known or unknown), due diligence of the company is undertaken to identify these liabilities and encumbrances and is usually more rigorous than the investigations undertaken where the assets of the business are sold. Asset sale or share sale? Generally, a purchaser will be more likely to prefer an asset sale to limit the extent of liabilities it takes on and to set itscost-base of the assets for Capital Gains Tax (CGT) purposes in any subsequent re-sale. 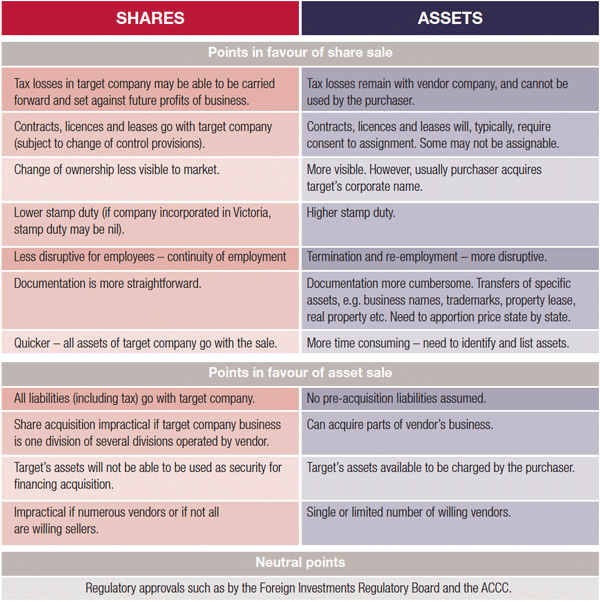 However, a vendor may prefer a share sale for tax reasons and to significantly reduce the extent of any potential liabilities that may remain with it. In most circumstances, the tax implications drive the structure of the transaction. Other key legal considerations under both structures are outlined in the table below. The appropriate due diligence process will depend on a number of factors, including the size of the business and the complexity of the business structure. To manage its risk exposure to breaches by the vendor in respect of undisclosed liabilities or encumbrances, the purchaser will obtain appropriate warranties and indemnities. Under an asset sale, any liability not specifically assumed by the purchaser will reside with the vendor. This may limit the need for due diligence to only those assets or liabilities that are specifically contracted to transfer to the purchaser. On the other hand, in a share sale the purchaser has the potential to acquire the unknown, and consequently a more thorough due diligence of the company is likely to be required by the purchaser. Further, a vendor should also conduct its own due diligence to identify any ongoing risk exposure for it, such as any guarantees or securities provided and to understand what critical warranties may be required of them. Whether you are considering selling or buying a business, our corporate and tax specialists can provide you with advice on the legal, commercial and tax implications of the transaction and assist in negotiating the terms of the sale and drafting or reviewing the legal documents. 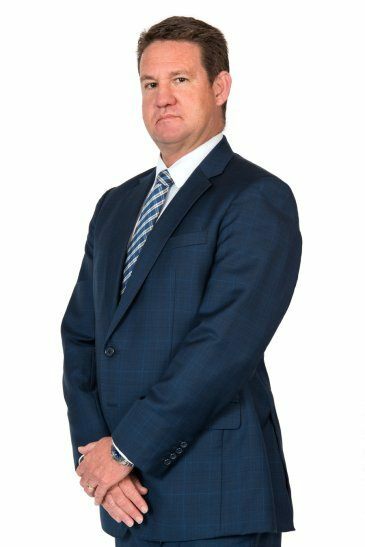 We make sure the rights and obligations of both parties are clear, avoiding unnecessary disputes and ensuring that everything runs smoothly throughout the transaction.